Looking for the best deals for your baby needs? Be sure to check out Buy Baby Deals to get all the necessities! 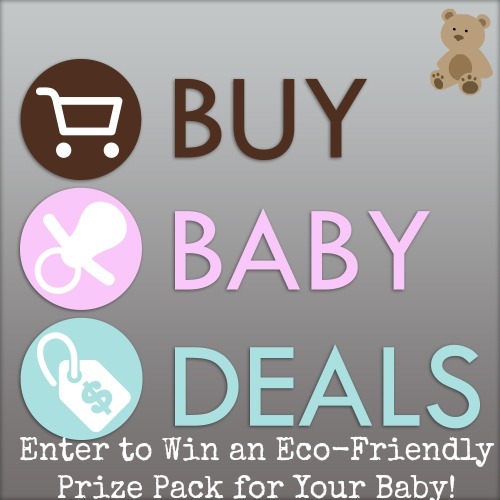 Enter to win an eco-friendly prize pack for your baby below! Good luck everyone! Katie’s Krazy Savings was recently given the opportunity to review eco-friendly and toxin free products for babies! She was given a wide-array of products such as toxin free nail polish (that is even mom friendly), a Park-it Magnet, Bogginheads Expression Pacifier, Non-Toxin/Chewable/Waterproof picture book and more! Check out her review here and make sure you enter the giveaway below to win all the items listed in the review! One lucky reader will win an eco-friendly prize pack for your baby from Buy Baby Deals. Mommy and Baby Eco-Friendly Prize Pack includes Pacifier, Non-Toxic Nail Polish, Park-It Car Magnet, Chew Proof book, Eco-Friendly Snack Pack – $51 Value. Giveaway ends June 30, 2014 at 11:59 pm EST. Giveaway is open to the US only. Enter to win via the Rafflecopter entry form below. Good luck! The participating bloggers were not compensated for this review/giveaway and are not responsible for prize shipment or fulfillment. Winner will be announced, 7/3/14 via the Rafflecopter and the winner will have 24 hours to confirm their prize. I think we would both get a kick out of the nail polish! I think she would loooove the nail polish! I think she would like the Bogginheads Expression Pacifier. My daughter would love the chew proof book, and I’d love for her to stay away from my books, maybe this will help! I know my daughter will love the chew proof book. She chews on the non-crew proof ones, so this will be great!